Consuls: Q. Cloelius Siculus, T. Larcius Flavus; A. Sempronious Atratinus, M. Minucius Augurinus (if 497); Post. Cominus Auruncus, T. Larcius Flavus (if 501). Dating: Exact year unknown; most likely 498, during T. Larcius’s second consulship. Circumstances: Military threat from the Sabines; Roman unrest. Mandate actions: Roman people quelled; Samnites sue for peace. Nomination: Need for dictator was suggested owing to “general anxiety” (Livy 2.18.3-4). Livy has creation in response to Sabines and Latins, Eutropius to large muster by Tarquin’s son-in-law (Eutr. 1.12); Dionysius emphasizes class conflict (5.70-75). Livy implies a consular was legislated (2.18.4-6). Powers: The appointment intimidated plebs, as there was no check or appeal from his actions (Livy 2.18.8). Eutropius likens dictator’s power to the emperor’s (1.12). From the outset in Livy there is a mag.eq. (2.18.3). Notes: Dedicated the temple of Saturn, says Varro (Macrob. Sat. 1.8.1). 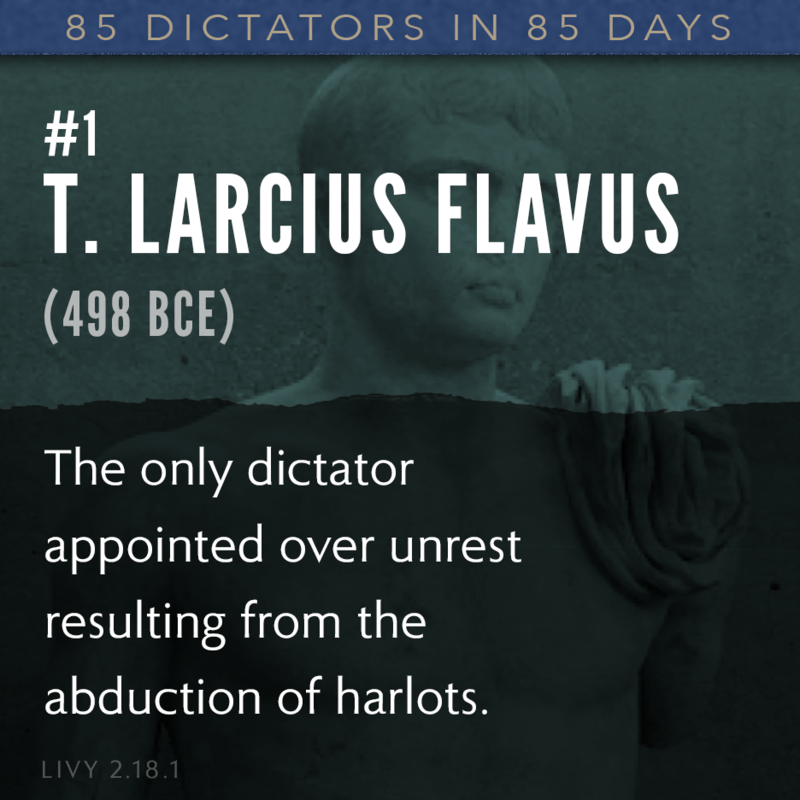 Lydus reports the first dictator as T. Marcius (Mag. 1.37.1, 1.38.1). In this year, during the celebration of the games at Rome, the Sabine youths, in a spirit of wantonness, forcibly abducted certain harlots. Men gathered hastily and there was a brawl which was almost a battle, and, trifling as its origin was, it seemed to threaten a fresh outbreak of the war. Besides the Sabine peril, it was generally known that the thirty Latin cities had already conspired, at the instigation of Octavius Mamilius. These grave apprehensions having occasioned a general anxiety, the appointment of a dictator was suggested, for the first time. While the public affairs were in this condition, the senate, considering by what means it could most effectually prevent the plebeians from creating any fresh disturbances, resolved to abolish the consular power for the time being and to create some other magistracy with full authority over war and peace and every other matter, possessed of absolute power and subject to no accounting for either its counsels or its actions. This enviable example set by Larcius was continued by all who afterwards received this same power till the third generation before ours. Indeed, we find no instance of any one of them in history who did not use it with moderation and as became a citizen, though the commonwealth has often found it necessary to abolish the legal magistracies and to put the whole administration under one man. … all who obtained this great power, whether in times of civil dissension, which were many and serious, or in order to overthrow those who were suspected of aiming at monarchy or tyranny, or to prevent numberless other calamities, acquitted themselves in a manner free from reproach, like the first man who received it; so that all men gained the same opinion, that the one remedy for every incurable ill, and the last hope of safety when all others had been snatched away by some crisis, was the dictatorship. † = died in office;  ‡ = resigned;  § = suffect. ° = appointing consul.